Ageing is one of the mega challenges of the 21st century. The fact that European societies are continuously ageing, leads to a situation that has never existed before. 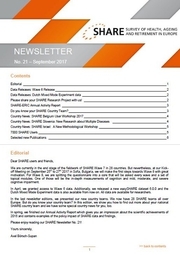 SHARE contributes to cope with these unprecedented circumstances through providing data for researchers all over the world as well as through own research. 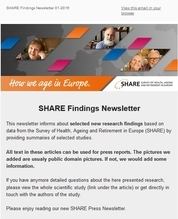 SHARE, the Survey of Health, Ageing and Retirement in Europe is the largest pan-European social science panel study. Around 380,000 interviews with approximately 140,000 individuals have been collected in over 20 countries since 2004. The data are available for researchers free of charge and very productive: about two weekly publications emanate from SHARE data, covering economic, health and social science topics from retirement saving to active ageing and care at the end of life. These scientific results are then communicated to public policy makers at the EU and national levels as well as to the press.